California District 41 and California District 66 both serve East County’s Little League youth baseball community. District 41 encompasses 17 leagues: Alpine American, Cajon de Oro, El Cajon National, El Cajon Western, Fletcher Hills, Jamul, Julian, Lakeside American, Lakeside National, Mountain Empire, Rancho San Diego, Rios Canyon, Santee Pioneer American, Santana National, Singing Hills, United Santee and West Hills. 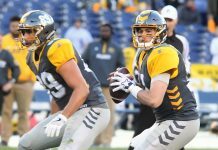 District 66, which is wedged between La Mesa, Jamul, Chula Vista, National City and San Diego, includes nine leagues: Lemon Grove, Spring Valley, Valley de Oro, Encanto, San Diego American, Las Palmas, Twin Hills, National City American and Southeastern. Both districts are members of California Section 7 that also includes District 42 (Chula Vista) and District 22 (Imperial Valley). The proverbial road to Williamsport, Pa.—and the coveted Little League World Series—starts with local championships at the district level, and then proceeds to the section level and beyond to include the Southern California sub-division and division championships that ultimately lead to the West Region championships and, at this point, national television exposure. All-star tournament play traditionally starts in late June and runs into August for some age divisions. Surviving teams are currently engaged in competition at the Southern California sub-regional level, with winners eyeing coveted Division III titles at the 10U, 11U and 12U levels the last weekend in July. Two older age divisions—Juniors (ages 13-14) and Seniors (ages 14-16)—also are a part of Little League baseball. Spring Valley Little League’s Senior Division squad is the farthest local youth baseball team to advance in the Little League postseason hierarchy after winning this year’s Section 7 championship. Spring Valley Little League hosted the Southern California-South Sub-Division III Senior Division tournament that began July 19, and was set to wrap up on July 23. 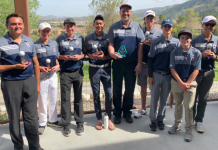 Besides Section 7 champion Spring Valley, other teams included teams representing Section 6 (District 32 champion Clairemont Hilltoppers), Section 8 (District 43 champion Newmark), Section 9 (District 72 champion Corona American) and Section 10 (District 46 champion Central Garden Grove). Section 7 champion Spring Valley won its opening two games in the sub-division tournament by defeating Clairemont, 11-3, on July 19 and edging Central Garden Grove, 17-15, in a high-scoring affair on July 20. Spring Valley drew a rematch against Central Garden Grove on Tuesday after the Section 10 champions eliminated Section 6 champion Clairemont, 9-7, in a losers bracket game on Monday. Spring Valley’s championship fortunes started in the District 66 finals after defeating TwinCanto, 12-2, on July 2. The Section 7 Senior Division championship tournament took place July 11-14 at the Spring Valley Little League complex located at 1312 Sweetwater Lane. District 42 champion Luckie Waller captured the first game in the teams’ best-of-three championship series by a score of 5-1 before host Spring Valley reversed its fortunes with consecutive 15-4 and 15-12 victories to claim the section title. The winner of the sub-division tournament advances to the Southern California Division III championship tournament. From there, teams advance to regional competition. The 2014 Little League Senior Division World Series tournament is scheduled Aug. 10-16 in Bangor, Maine. Lemon Grove Little League finished runner-up in the international championship for Senior Division teams in 2012 after dropping a 6-3 decision to Juvenil de Guatemala of Guatemala City, Guatemala. West USA region champion Lemon Grove defeated Central USA region champion Grand Rapids, Mich., 6-1, in the international championship tournament semifinals. A pair of East County teams—Fletcher Hills in the 10U division and Rancho San Diego in the 11U Division—advanced to the championship round at this year’s Little League section championships. District 42 champion Chula Vista American defeated Fletcher Hills, 7-6, in a seven-inning contest on July 15 to win this year’s section title while District 42 champion Sweetwater Valley defeated Rancho SD, 15-5, on July 14 to claim this year’s 11U Division title. Fletcher Hills opened the four-team tournament with a 10-0 loss to CV American on July 11 but then eliminated District 66 champion Las Palmas, 11-0, in a challenger bracket final on July 12 to advance to the challenger bracket final against District 22 champion Brawley on July 13. Fletcher Hills defeated Brawley to draw a championship rematch against CV American. The section tournament initially started in Imperial Valley, as hosted by District 22, but with the final two teams both hailing from San Diego County, the championship series took place at the Sweetwater Valley Little League complex in Bonita July 14-15. Fletcher Hills erased a 4-1 deficit against CV American to win 5-4 on July 14 to force a second championship game—the so-called “if” game—the following day. Fletcher Hills led, 4-1, early in the July 15 championship game until CV American pushed across three runs in the fourth inning to tie the game at 4-4. The District 42 champions went ahead, 6-4, in the top of the sixth inning. However, a two-run home run evened the game in the bottom of the sixth inning for the District 41 champions to force extra innings. CV American pushed across what proved to be the winning run on a single by Devin Hinojosa in the top of the seventh inning to prevail for the section title and, in the process, eliminate Fletcher Hills from postseason play. This year’s Fletcher Hills 10U All-Star team included manager Jon Brown and coaches Rich Haar and Pete Vasiliou. Players included Justin Brown, Domenic Carini, Bryce DeBruin, Ethan Emerson, Cooper Gibson, Benjamin Haar, Jacob Jackson, Evan Klein, Sam Lawson, Cade Martinez, Kaden Pankow, Sage Sturgeon and Evan Vasiliou. The four entrants in the 11U All-Star Section 7 tournament included District 41 champion Rancho San Diego, District 66 champion Lemon Grove, District 42 champion Sweetwater Valley and District 22 champion Imperial. Rancho SD defeated Imperial, 16-1, in the tournament opener on July 11 while Sweetwater Valley scored an 11-1 victory against Lemon Grove to set up a winners bracket match-up between Rancho SD and Sweetwater Valley on July 12, won 18-1 by Sweetwater Valley. Imperial eliminated Lemon Grove, 17-6, in a losers bracket game on July 12 to meet Rancho SD in the challenger bracket final on July 13. Rancho SD eliminated Imperial, 20-3, to draw championship rematch with Sweetwater Valley. But Sweetwater Valley’s bats proved too hot to handle as the District 42 champions overpowered the District 41 champions with nine runs in the first inning. Sweetwater Valley starter Preston Fleming kept Rancho SD in check, save for a couple of home runs, until reliever Levi Mendez got the final two outs for the victors. The 10U and 11U division playoffs both end at the division level. This year’s 12U Section 7 tournament took place July 12-15 at the Sweetwater Valley Little League complex. The four entrants in the 12U section finals included District 41 champion Rancho San Diego, District 66 champion Lemon Grove, District 42 champion Sweetwater Valley and District 22 champion Brawley. Brawley defeated Lemon Grove, 11-5, while Sweetwater Valley defeated Rancho San Diego, 16-2, in a pair of opening round games on July 12. In ensuing games on July 13, Sweetwater Valley defeated Brawley, 13-4, in a winners bracket contest while Rancho San Diego eliminated Lemon Grove, 14-3, in a losers bracket game. Brawley defeated Rancho San Diego, 7-3, in the challenger bracket final on July 14 to draw a championship rematch against Sweetwater Valley. The District 42 champions won 14-2 to advance to the sub-division round. The Little League World Series is scheduled Aug. 14-24 in South Williamsport, Pa. 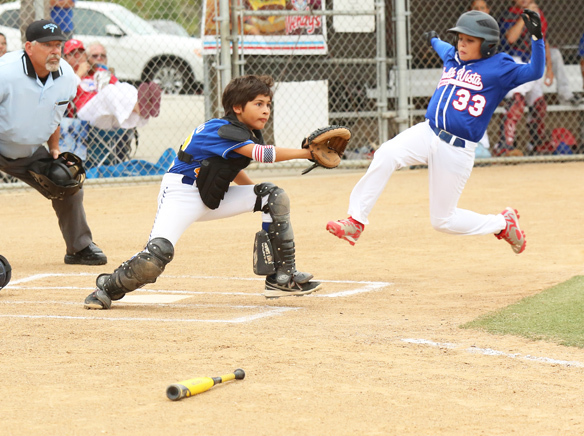 The Section 7 Junior Division championship tournament took place July 7-15 at United Santee Little League. The four entrants included District 41 champion Rancho Jamul, District 66 champion Spring Valley, District 42 champion Eastlake and District 22 champion Brawley. In tournament openers on July 12, Rancho Jamul defeated Eastlake, 12-2, while Brawley defeated Spring Valley. In action the next day, Brawley defeated Rancho Jamul, 7-3, in a winners bracket contest while Spring Valley eliminated Eastlake in a losers bracket game. Eastlake’s entry included two members from last year’s U.S. national champion Little League World Series team from Eastlake Little League: Micah Pietila-Wiggs and Dominic Haley. Spring Valley defeated Rancho Jamul in the challenger bracket final on July 14 to advance to the championship game against Brawley the following day. However, Brawley earned the right to advance to this week’s sub-division tournament at Rancho Peñasquitos Little League with a victory against Spring Valley. The Junior League World Series is scheduled Aug. 9-16 in Taylor, Mich.